Books. You read them. You put them in libraries, or on your shelves. 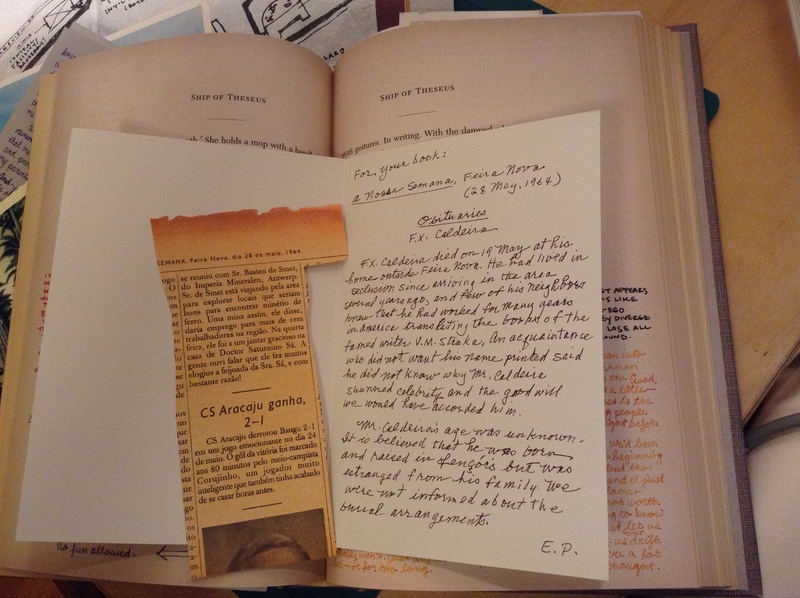 You can use old ticket stubs, postcards, and bits of thread or post-its to mark your place; or write scholarly notes in the margins – particuarly if it’s an EngLit text that cries out for annotation, and it’s your book. All these are interactions with the physical form of the book that don’t affect the actual text in the slightest. A pencilled note marking a point where Dorothea Casaubon realises her tragic mistake doesn’t change the course of the plot, or alter George Eliot’s authorial intention. If anything, the notes reveal more about the reader than the text, and are superfluous to the reading experience. So what if the notes, the postcards, and sundry other bookmarks become the story? What if the alternate universe extends beyond the linear narrative of a conventional novel, presenting the peripheral notes as another story? OK, I’m paraphrasing what may have happened in the minds of the publishers and JJ Abrams, and, possibly his collaborator, Doug Dorst. Given that Dorst is an academic, he probably had words like “intercontextuality” and “dichotomy” sprinkled around his consciousness, for starters. But having read S, I’m still trying to work out why it happened. Does the book as a literary form need a reboot? Is there a need to engage new readers in ways hitherto unconsidered? It’s about 460 pages long, styled to look like a long-forgotten library book, originally published in the 1950s or thereabouts, even down to the paper quality. Some reviewers say it even smells like a musty old tome, but all I can say is that they need to spend more time in second-hand bookshops. The book comes in a black box, sealed with an S. I know it’s not often that you start a review with the packaging, but the look and feel, in this case, is actually more important than the book itself. Rather than just relying on boring old words to tell a story, S. is designed to spark your imagination, tickle your curiosity with a box of stuff from another world. And all for £28. (it is cheaper on Amazon, but my friendly local bookshop serves good coffee and has slightly better working conditions). Where were we? Ah yes…the book. It’s called Ship of Theseus, written by VM Straka. The book opens with an essay regarding the identity of the author, VM Straka, who appears to be some all-purpose International Man of Mystery. At this point a note drops out of the book, containing a neat, handwritten list of all the murders, assassination attempts, bombings, kidnappings, libels and general nogoodnikness that VM Straka was implicated in between 1903 and 1945. He was busy. When he wasn’t single-handedly battling the forces of fascism, Straka wrote highly successful allegorical thrillers about identity and dreadful deeds that appear to have some kind of literary merit, according to the notes. Meanwhile, in the margins, there’s a sort of meet-cute going on between Jen, an undergraduate English major, working part-time in the library, and Eric, the book’s owner. Jen has lovely handwriting, is graduating in May, and doesn’t know what she wants to do with her life. She has found the book in the library, and returned it to what she thinks is Eric’s office, leaving a note on the title page. Because in this world, post-it notes haven’t been invented. Eric writes a reply, offering to lend her the book, and leaves it where she can find it. Eric writes entirely in capitals. Jen does not think this is a bit weird. But then again, Jen really loves the book, which is in itself a bit odd. Ah yes, the book. Ship of Theseus. Well, there’s a guy. He’s lost his memory. He’s walking around a strange town, soaking wet. There’s a monkey. There are footnotes that bear very little relation to the book, and contain lots of academic-sounding references to things and people that don’t actually exist, according to Literary Construct Jen, and Literary Construct Eric. Eric starts leaving things in the book. There’s a code wheel, very nicely constructed by Eric with colour coding and everything, that apparently helps you identify what the random footnotes are actually saying. I played with it once, got bored, and decided to use it as a bookmark. Until it fell out, which it did repeatedly. 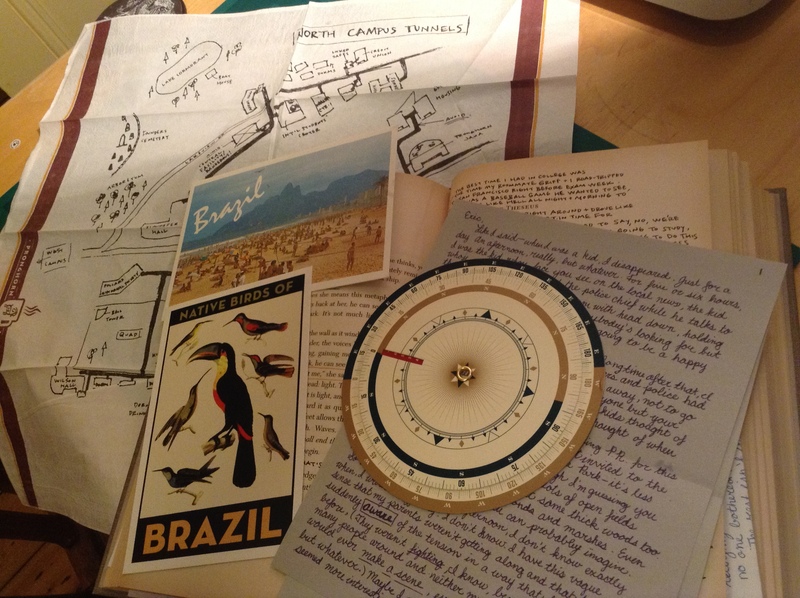 Along with the maps, the old photos, the “authentically aged” newspaper cutting, the postcards from brazil, pictures of monkeys, letters from fictional Swedish universities (in Swedish), notes from Jen and Eric about assorted childhood traumas. My favourite is a gloomily-lit sepia print of a closed-off archway in a wall. The map is printed to look like it was drawn on a serviette, and shows how Eric gets around campus without people seeing him. Don’t take this book on the tube. You will regret it. Why can’t people see Eric? Yes, Jen asks this question when even she gets a bit frustrated with Eric the Enigma. Well, Eric was a post-grad, working for Jen’s professor and researching Straka’s International Mysteriousness. There are many academic theories surrounding Straka’s identity, since nobody knew what he looked like. The most plausible one appears to be that Straka is a catch-all identity devised by an international band of writers working between 1914 and 1950. But who wrote the actual books, is the question that the academics are asking. The books, apparently, are jam-packed with symbolism and allusions to fictional political events, and there is obviously a Message to be decoded. Eric developed a theory that was appropriated by his supervisor, and Eric did what any sensible post-graduate student would do, and trashed the building. Like you do. After a short spell in a special hospital for Recovering Pale Young Men, Eric is back, creeping around campus using a network of steam tunnels, living in an ice cave and chatting up vulnerable undergrads in the margins of old library books. I think that’s the premise. I say “think”, because I’m not sure what I’m supposed to think. 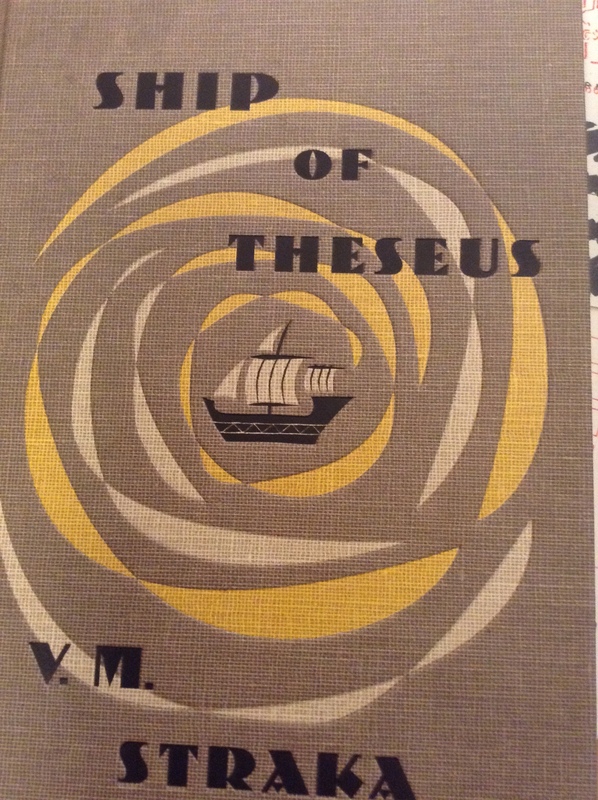 The actual book, Ship of Theseus, is like one of the later episodes of Lost: full of strange coincidences and secret ways and slightly bizarre situations that have some sort of allegorical significance. The book in the margins is a love story between a clever young woman with nice handwriting, and a damaged young man. Like everything JJ Abrams does, S is clever. I’m reminded of a historical education pack that I had as a kid (I was that sort of kid), containing facsimile documents and reports of an event that you had to use to construct your own version of what happened. S gives you a book with two parallel narratives going on in the margins, and a pile of things that offer clues to how you could write the story of Jen and Eric for yourself, or even work out the identity of VM Straka. The question is, do you want to? They lost me at the code wheel. After that, I read the “clues”, admired the production values, and gave up. The central narrative of Ship of Theseus was a kind of substandard pastiche, combining a bit of Kafka, a bit of Hemingway, a smidge of Golding and sundry thriller tropes – and didn’t actually amount to much. The love story in the margins was sweet and sometimes touching, but left too many questions about timing (the inks kept changing colour, and I wondered when these notes were supposed to have been written) and motivation. And are we really supposed to believe that international capitalists cared so much about a writer of potboiling thrillers that they would concoct a vast conspiracy to assassinate and intimidate his associates? Given the political climate of the years between 1918 and 1939, there were plenty of cost-effective opportunities to kill writers out in the open. It seems rather naive. It sounds like the Janet and Allan Ahlberg’s Jolly Postman. Only that had little envelopes in it so everything didn’t fall out. It’s kind of like Jolly Postman for grown-ups. According to other reviewers, you’re supposed to read the book AND the notes to “get it”. About halfway through, I started thinking wistfully of “Middlemarch” and how Eliot achieves an almost complete immersion in a fictional world, emotional connection with the characters, and a sense of foreboding without having to resort to meaningless footnotes and drawing maps on serviettes (note deliberate use of non-U terminology). You can get it for the Kindle! You can’t get it for MY Kindle unfortunately but you can get it for fancier Kindles than I have. That would seem to destroy the point of it somehow.